This building, squeezed into the contemporary urban fabric of Mexico City is the 18th-century mansion built for don Antonio Rodríguez de Pedroso y Soria, Count of San Bartolomé de Xala, a member of one of New Spain’s wealthiest families. The original house, opulent for its time, included a carriage entrance, central courtyard, stables, tiled staircases, and a porter’s lodge, a kitchen and pantries, a formal parlor, several bedrooms and a family dining room. Most of the living spaces for the family occupied the upper stories of the house, turning inward to face a central patio, as was typical in elite homes in Spanish American cities. A set of wide wooden doors was originally set in the main opening, which led to an inner courtyard of the house. The red stone still visible in the upper stories of the house is tezontle, a volcanic stone that was an important building material in and around Mexico City. 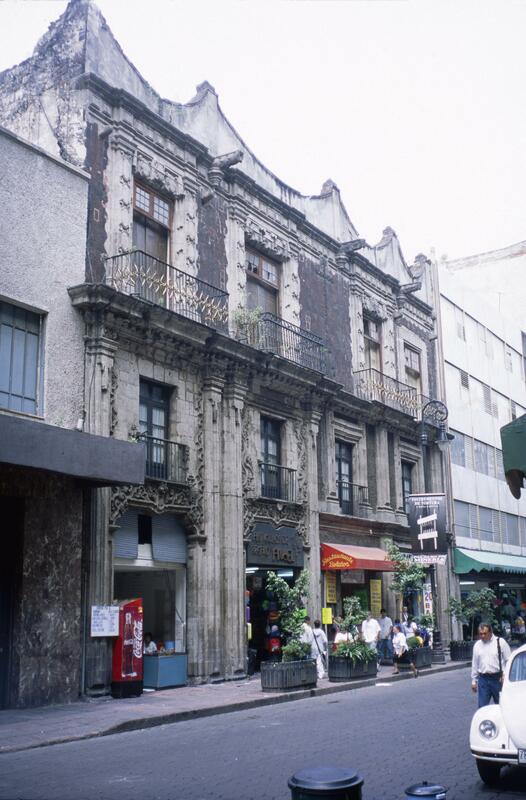 Lorenzo Rodríguez, the same man who designed the Sagrario in Mexico City and several other houses for wealthy residents in Mexico City, was the architect of this house. His patron was don Antonio Rodríguez de Pedroso y Soria, Count of San Bartolomé de Xala. The Count had attended the Royal University in Mexico and, through his life, became an extraordinary collector. An inventory of house from 1784, a portion of which is included in the Vistas library, indicates he owned numerous paintings, a great deal of fine furniture, and many imports from Asia, Europe and other regions of Spanish America—from Chinese porcelains to English clocks and religious images from Naples and Guatemala. Stone and wood are the primary building materials. Some of the stone is tezontle, a distinctive red-colored stone used throughout Mexico City in both pre-Hispanic times and later. 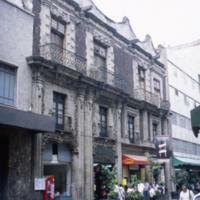 Once one of Mexico City’s premier residences, the urban mansion of the Count of Xala still forms part of the urban fabric. As this photograph suggests, however, the building now houses very modern businesses. Beyond the obvious glimpse into luxury the mansion offers, it is an important example of the porous boundaries between religious and domestic realms in urban Mexico City. At the time the architect took up this commission, he had become famous for his work on the Sagrario, the city’s parish church, just a few blocks away. Moreover, the Count of Xala was close friends with the Archbishop of Mexico and, upon the death of his wife, decided to become an ordained priest. As one of his daughters was nun, the material wealth of the house—which included hundreds of devotional objects—passed to another daughter. Boyd, E. 1958. “Review of Una casa del siglo XVIII en México, la del Conde de San Bartolome de Xala.” The Americas 15 (1): 92-95. Romero de Terreros, Manuel. 1957. Una casa del siglo XVIII en México, la del Conde de San Bartolomé de Xala. Mexico City: University of Mexico Press.